This sun-drenched room features glowing hardwood floors and a picturesque bay window overlooking the front garden and historic Reservoir Park. 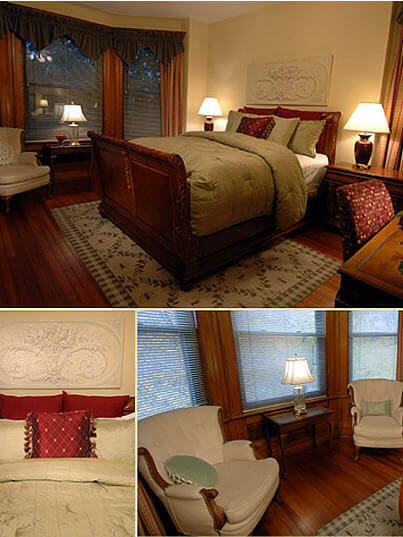 Relax in graceful chairs nestled in the bay window, or lounge in the ornately carved queen-sized sleigh bed dressed in silk comforter and pillows. A beautiful floral tile mural extends that special garden feel into the private bath. Why not head outside to spend some time in the inn’s botanical garden? Our carefully tended plot inspires relaxation and harmony.